He is. He’s the size of a large cat, whereas Sparrow is a very small cat. His mother was a Flemish Giant. I’ve had a purebred Giant once, and she weighed seven kilos and was 2/3 the length of my leg when lying flat out. He’s not nearly as large as her, but he’s big. Do your pets wonder why you love putting cameras in their faces? The rabbit thinks it’s a really stupid food to offer him, and my cat immediately stops doing the amazingly cute stuff she does, because she’s a cat. When I do that my dog just stares at it, as he knows it has something to do with me, and starts to bark. My dog poses for the camera. (not literally, just like she knows she is supposed to do something cute) My grandma’s dog hates the camera. What can I say. Animals are like people and have their preferences. Hey I noticed that Milla has a new profile picture. Is there a thread that this belongs in? Anyways, what sea creature is it this time? For some reason the new picture makes me sad. Sorry, I’ve still got flu and I lay down for a rest this afternoon and crashed out for hours. I meant to post this first. This image is a commonly used meme. 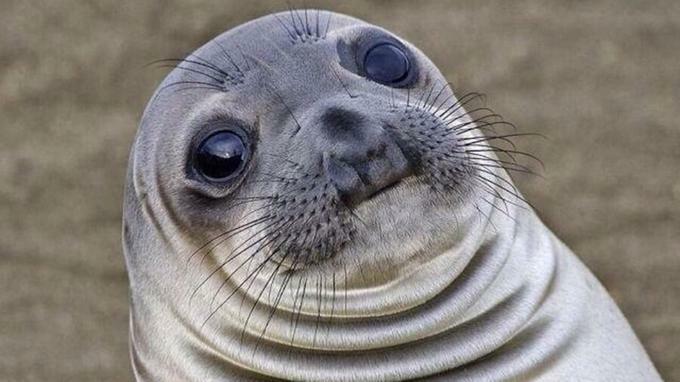 It’s called Awkward Seal.